I don’t know whether this finds entry in "embracing sustainability” but I will let you be the judge of it. This is part of experience in Jan this year in Delhi, when we visited my parents in Delhi. 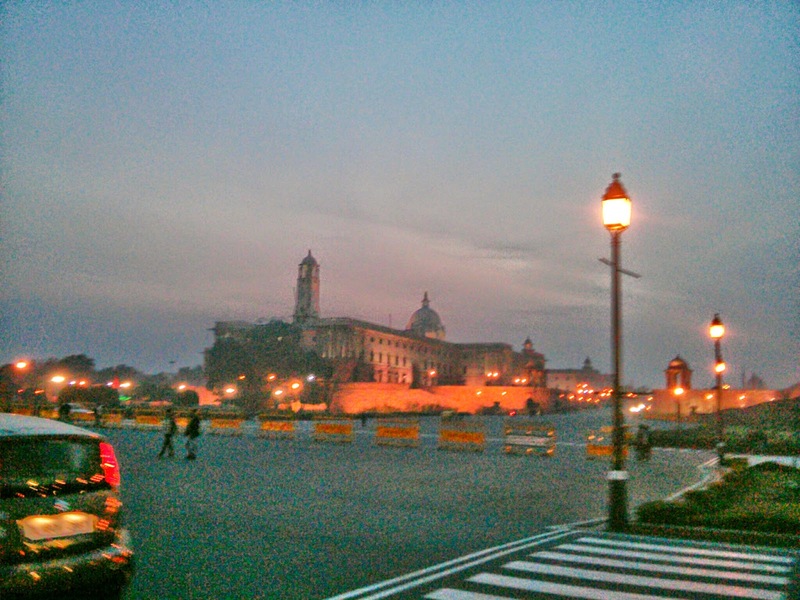 Jan is of the most pleasant months In Delhi if you have weathered the Delhi 450 summers . Let’s say it’s one of the months when you can think of exploring the city without heat stroke during the day ( ya I am exaggerating a bit !) 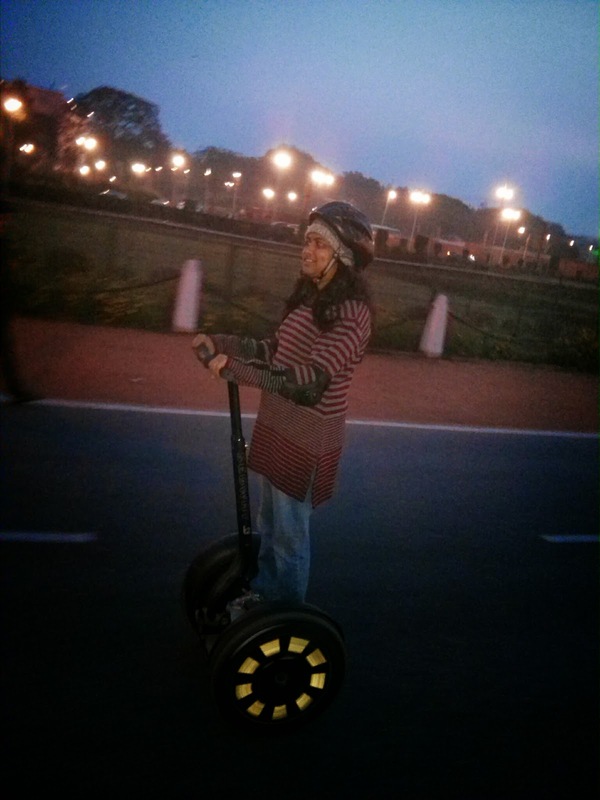 , Since both( Preethy and me ) of us had not seen the central parts of Delhi , thought would be a good time to see it ,however with a bit of difference , It was not on foot but on a two-wheeled, self-balancing, battery-powered electric vehicle AKA Segway . 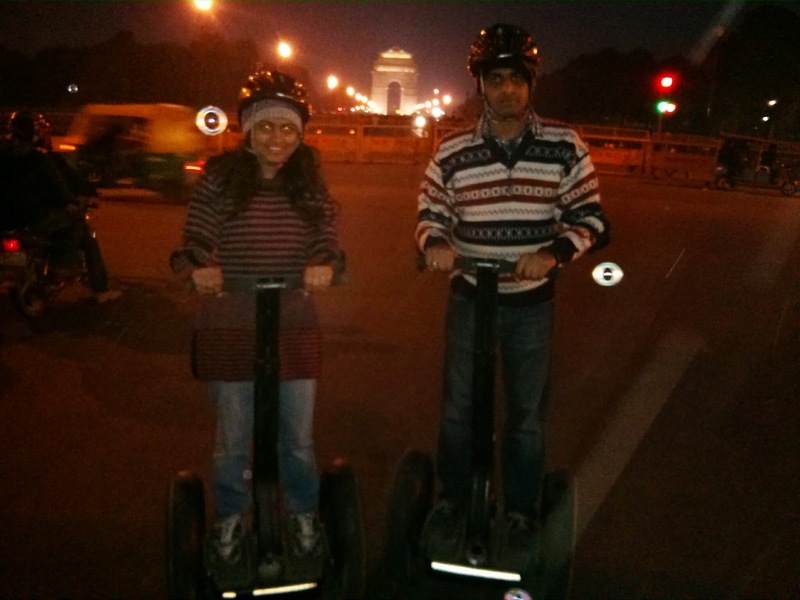 Coming back to the start, so we booked online for segway tour for about 45 mins on a weekend evening and we reached the designated place, which is quite a location considering one end of road is Rashtrapati bhawan and other end is India Gate. At the appointed time , we started wandering around trying to figure where the tour guys would meet up with us at same time trying to look for similar touristy type ( Indians , foreigners et al) ,unfortunately there was no one close to us , everyone else was near Aloo chat guy( nice and spicy!) or heading to Rashtrapati Bhawan for a tea with President. After arm bands and helmets and instructions to operate were given, which is as basic as it gets , lean forward it moves ahead , turn the handle like joystick left it turns left, pull stick back it brakes ,we went around a few spins in parking lot, we were expecting some more wandering tourists to join us ..But as luck would have it we were the only ones in tour. Off we went circling the great houses of power, parliament house and up towards the north block and south block ....we drew many heads towards us, the tour guys led us clearing the way. Since road leading to India gate is pedestrianised after 6 pm, we were somewhere between and full fledged 2-wheeler and pedestrian, the police guys allowed for the sheer novelty of transport. 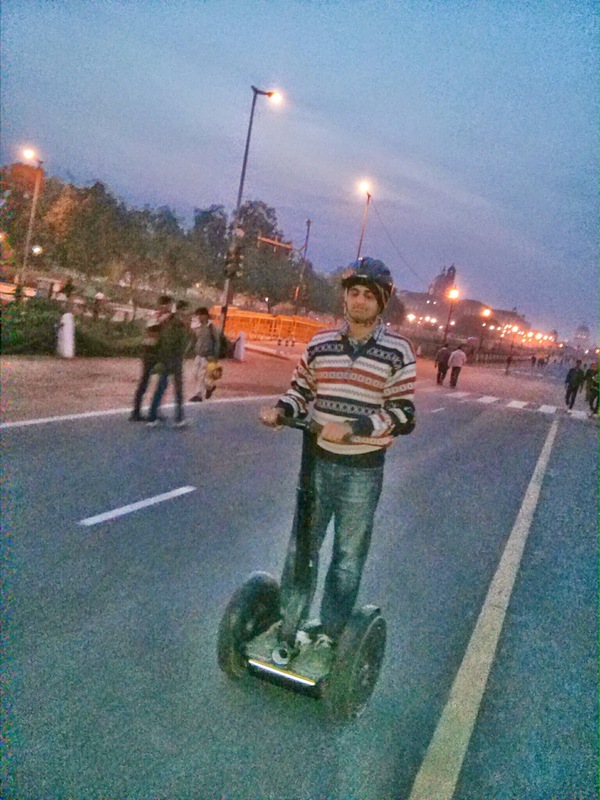 It was I think around 100C and we would be zipping on wide broad roads of central Delhi, and I was saying Wheeeee! As we went around, though the temp really froze our hands (Pl brings gloves if you wanna do this in winters) and really gave you gr8 high. I was expecting the tour guys to give a sense of history of the buildings...but that wasn’t to be. Mini celebrities near India Gate! All in all , it is an excellent way to commute in large campuses with good roads , and can take reduce the noise / tail pipe emissions from the vehicles and at same time give you thrill of zooming through a leafy campus / historical boulevard with minimal effort. Have you tried one? How was your experience? Let us know!